Now, you wouldn't exactly call the retail package of our Sony Xperia Z1 Compact rich in content. There's the smartphone itself, an A/C adapter and a microUSB cable. Headphones were missing and we didn't get a microSD card either. Of course, these things vary across regions, so you could receive a better treatment. 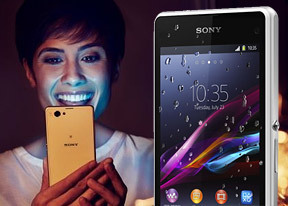 At 127 x 64.9 x 9.5mm, the Sony Xperia Z1 Compact is a full 17mm shorter and 9.1mm narrower than the full sized Xperia Z1. This makes a huge difference in terms of both handling and pocketability, and the Compact is easily worthy of its name. Its footprint is only a tad larger than that of an iPhone 5s and you get an extra 0.3" of screen diagonal to show for it, so there's little to complain about here. The profile is hardly as impressive though, as the Sony Xperia Z1 Compact is notably thicker than the flagship, but the truth is at this size it doesn't make that much of a difference. The smartphone will still fit in any pocket and the only downside is that it will create a slightly bigger bulge. The weight of 137g is about average these days and, at this size, strikes a good balance between solid feel and portability. Glass-covered front and glass-like hardened plastic on the back panel, garnished with a one-piece metal frame that runs all around - the Sony Xperia Z1 Compact is definitely a looker. Sony is using the same two-stage process as on the big Z1 to anodize the aluminum frame and has finished the middle of the sides for a two-tone look, which works very well. The slightly thicker profile takes some of the cool away, so we wouldn't say it's just as impressive as its bigger brother, but the Compact is a solid phone, a premium package no doubt. In fact, if it wasn't for the Apple iPhone 5s, the Sony Xperia Z1 Compact would certainly be the most attractive smartphone in its class. As luck would have it though, it will have to settle for the silver. It's not a distant second, mind you, and some would probably even find glass more attractive than metal. Of course, the choice of materials has its downsides too - the glass and plastic panels are easy to get covered in smudges and some effort is required if you are to keep the Xperia Z1 Compact looking its best. The thing is that glass doesn't offer the best of grip. The handset does feel slippery but, at this size, this isn't too big of an issue. With no stretching of the fingers required during operation you are far less likely to drop it. The diminutive Sony flagship is pretty well put together, too. There's weight and substance for a nicely solid feel in hand. There are no gaps between the panels and it gives away no disturbing sounds when handled normally. Knocks against the middle of the back panel will sound somewhat hollow, but that's not something you will be doing often. Generally we'd give 8.5 out of 10 to the Xperia Z1 Compact for design - the only penalties being for the less than stellar slimness and the dock connector gap on the left.